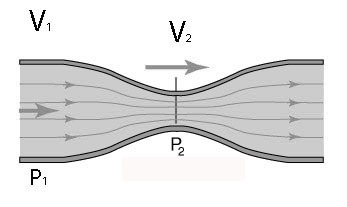 Bernoulli's principle states that for a fluid with zero viscosity, an increase in the speed of the fluid occurs simultaneously with a decrease in pressure or a decrease in the fluid's potential energy. The principle is named after Daniel Bernoulli who published it in his book Hydrodynamica in 1738. Video demonstrating Bernoulli's principle using paper -- the air that travels across the top of the paper is moving faster than the air under the paper. The pressure in the moving stream is less than the pressure under the paper. Bernoulli's principle can be derived from the principle of conservation of energy. in a steady flow, the sum of all forms of energy in a fluid along a streamline (family of curves that are instantaneously tangent to the velocity vector of the flow) is the same at all points on that streamline. This requires that the sum of kinetic energy, potential energy and internal energy remains constant. This constraint gives rise to a relationship between the velocity (speed) of the fluid, its pressure, and its elevation (relative height). Thus an increase in the speed of the fluid occurs with a simultaneous decrease static pressure, potential energy and internal energy. Bernoulli and Flight --- What contributes to lift in an airplane? Aircraft wing geometry has a large effect on the amount of lift The wings of the vehicle have aerofoil* shaped cross-sections and for the given flow conditions the aerofoil shapes will create a pressure difference between upper and lower wing surfaces. There will be a high pressure region underneath and a very low pressure region on top. Air flows faster over the top of the wing decreasing the air pressure. Airflow is slower underneath the wing so air pressure is greater there contributing to lift. 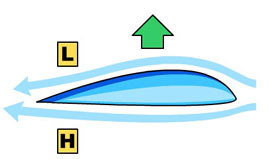 The fluid on top of the wing is accelerated and the fluid on the bottom of the wind is slowed down compared to velocity of the aircraft itself because the wing geometry and angle narrows the flow area above the wing and widens the flow area below the wing from http://physics.stackexchange.com/questions/13030/why-does-the-air-flow-faster-over-the-top-of-an-airfoil. The concept of lift however is very complicated and cannot be explained alone using Bernouilli's principle. Newton's laws are typically preferred over the Bernoulli principle to explain lift. See References and Readings for further discussion. Bernoulli or Newton's Laws for Lift? 1. Why when you squeeze on a water hose the water squirts a greater distance. b) by squeezing on the tube you decrease the cross-sectional area reducing pressure but increasing velocity of the water. 2. What is the formula for pressure? 3. Which statement(s) related to Bernouilli's Principle are true. a) Bernoulli's principle can be derived from the principle of conservation of energy. b) for a fluid with zero viscosity, an increase in the speed of the fluid occurs simultaneously with a decrease in pressure or a decrease in the fluid's potential energy. c) in a steady flow the sum of kinetic energy, potential energy and internal energy remains constant. 4. What statment(s) concerning lift are true. a) Air flows faster over the top of the wing decreasing the air pressure. Airflow is slower underneath the wing so air pressure is greater there contributing to lift. c) Newton's laws are typically preferred over the Bernoulli principle to explain lift. 5. Why when you blow over a piece of paper it lifts up?